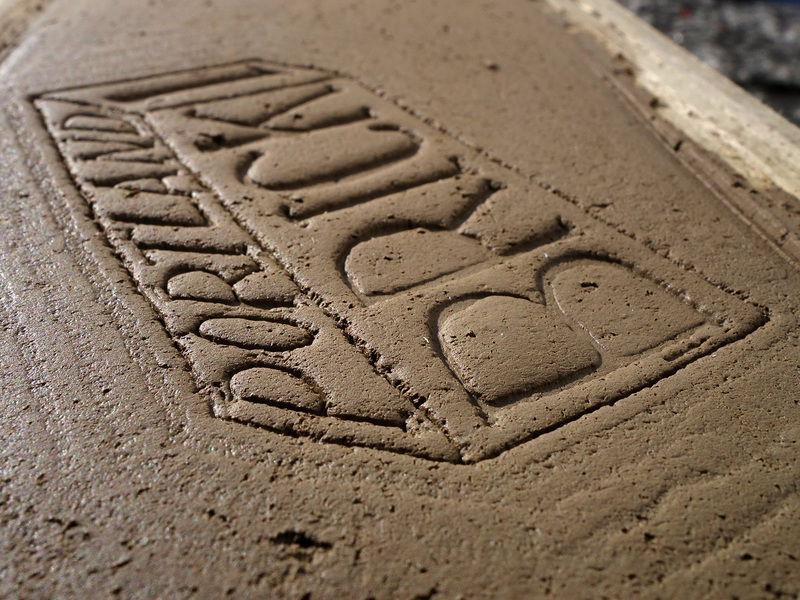 Portland Brick takes the intangible memories of a place and makes them tangible through the use of stamped bricks. 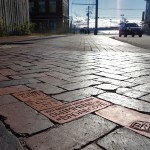 The ground that we walk on is transformed into sidewalk bricks that tell the stories of the people who live and work in the India Street neighborhood of Portland, Maine. 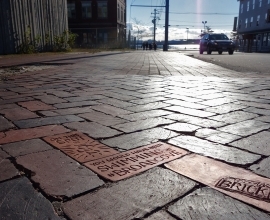 Brick is ubiquitous in Maine, creating an urban aesthetic that is defined by the color of fired clay and an architecture designed around the limitations of brick as a building material. We have built our infrastructure with this very humble material that is all around us; we live in brick buildings, work in them, and go from place to place along brick sidewalks. In Maine, as in all of New England, we are lucky to have huge deposits of red clay that’s decomposed from rock over the course of millions of years through the growth and retreat of glaciers. 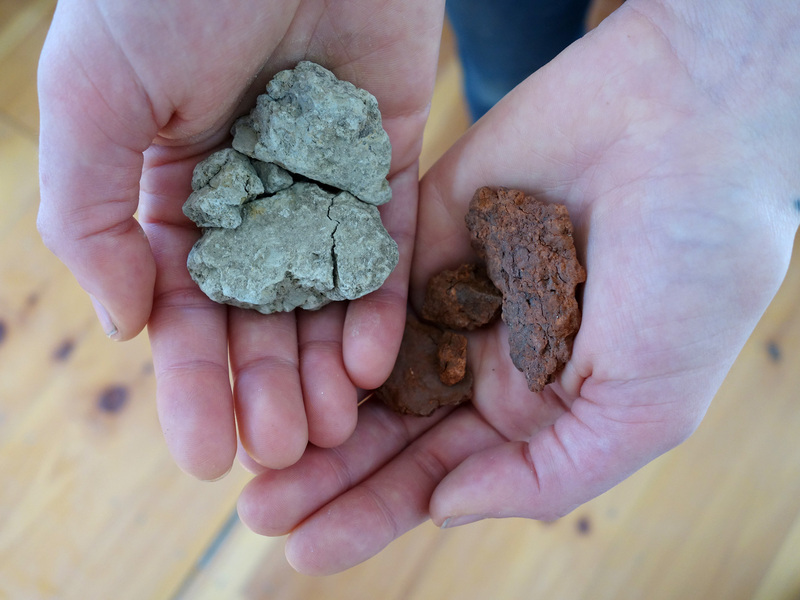 Even as a potter who works with clay daily, I’m struck by the physical presence of brick clay in particular, which is gritty, rough, sticky, and heavy. It doesn’t have the plasticity that a throwing body has, so it flakes and tears in way that suggests it likes to be a solid mass, rather than coaxed into a thin wall. Since its surface is rougher than other clays, the stamp of a letter is less harshly articulated and comes through as soft and puffy. Raw, unfired clay in Maine is typically greenish or bluish in color, depending on the location of the deposit. The lengthy process of preparing clay for use involves slaking down (dissolving) bone dry chunks of clay into a slurry, sieving it in order to remove pebbles and rocks, and then drying it out to a workable consistency. As the slurry dries in cotton sheets in wooden frames, there is a point at which the clay develops a skin on it, which allows it to be flipped out of the sheet. In that moment, it feels like a living thing. Grog (ground up fired clay) is then added back in to help with shrinkage and durability. When fired, the native clay turns from its raw state of anaerobic green/gray to bright orange to a rich red and finally to a dark brown when over-fired. In Portland sidewalks, there is a huge diversity of brick colors, dimensions, and sizes, because of differences in taste, function and sources over the years. Often, you’ll see blackish bricks that were fired in coal or gas kilns that reduced and pulled the oxygen from the clay. For our Portland Brick project, the bricks will be a rich red color. Clay has an amazing capacity to hold memory. For example, if it’s bent in one direction and then bent back, it will re-bend to some degree to the first position in the firing. Clay remembers what has happened to it. I love this notion of embodied physical memory. Of course, the surface of clay also receives information beautifully. Other options that I rejected in this project were to carve the letters or cut them out with a water jet, because there’s a harshness both in the process and in the product. In contrast, soft clay receives a stamp in the same way a pillow receives a heavy, sleepy head. Looking closely, one can see the round curve of the clay when it was pressed down. When clay’s soft, it’s soft, and when it’s hard and fired, it’s near permanent. Most often the information we have from ancient civilizations comes from ceramic objects. Likewise, these bricks will survive most of us and be a legacy. 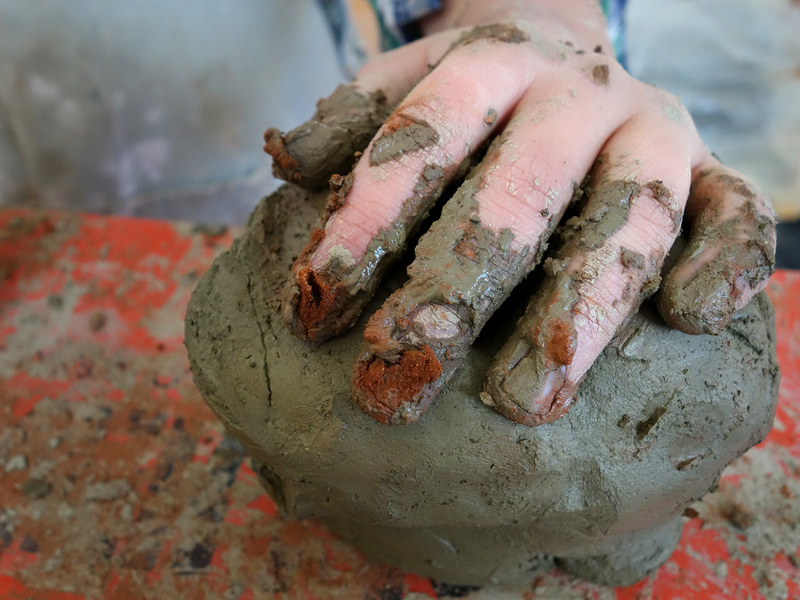 Local clay feels like the perfect material to receive a memory and then hold on it forever.